- grab high quality pictures from a SLRD cameras with utilities like gphoto2. - play a sound when grabbing a frame. An option exists that allow users to define a command that is executed when activating/disabling the preview, but doesn't repeat on each image grab. It would enpower users to integrate LSM into a custom workflow. EDIT: Modified description not to be so specific on the usage of the feature. 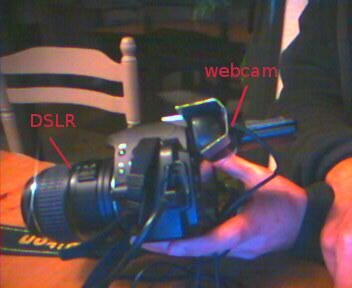 Webcam and DSLR camera wouldn't capture the same frame since they can't be in the same place and position. How do you imagine to fix this problem? First, I wan't to say I'm very glad someone stood up to take this project in charge again and apologise if the feature requests don't really belong in the bug tracking system. As for your question, I must emphasize that the webcam would in that setup only serves as a visual guide that helps you to achieve a motion. In that case, a different camera angle doesn't matter as the preview you're looking for is of the motion and not of the final composition of your image. Numbers of professional studios work in this way, as processing very large images is heavier on cpu than SD. I agree that for some scenes, it will come off as a problem though. Sorry if I have trouble putting words on my thoughts as english is not my native language ! Thanks Arthus. It's very clear now. So far we discussed only about DSLR camera with live view planning to implemento a double shot (one from the low res preview and one HD shot), so to put in place a proxy workflow. I understand your need comes from a DSLR camera vith no live view. Indeed, I did forgot to mention that important point ! I can think of a few more usages to the original feature I was requesting. You could use it to play a sound when grabbing a frame, as I saw in another feat. request. You could interact with a servomotor (via arduino for example) in order to achieve a camera motion. As I see it, it would be a powerful added value to the software in a Gnu/Linux tubes philosophy way ! It also seems quite trivial to implement as there is already the polling that works in a similar way ( executes on button activation). I did go through the sources a bit to try a dirty hack, but I don't know much about C programming, otherwise I would have gladely done it myself. By "the polling ", I meant the prepoll command you are able to define in the preferences at the moment. Source code only, for now. Proper DLSR support, with both medium-resolution continuous preview and high-res capture is on my TODO. :-) It requires some invasive rewriting of LinuxStopmotion, though. I've already stumbled accross this experimental feature, but I d'like to remind here that DSLR grabbing is one of many use this feature would allow. I see it mainly as a way for LSM to integrate into a custom workflow. It's hard to know how to do this nicely and cover all the bases. You want the "on capture" command to be able to capture an image. So, $(IMAGEFILE) should be different to the one passed into "start daemon" and "pre-poll", so that it isn't interfering with that operation. But then if the "on capture" doesn't actually capture an image (if it plays a sound, for example), you will never capture anything. Options: (1) Ignore the problem. Assume we get a capture. (2) Add a check box to say "this command captures an image"
(3) Allow the command to copy the latest preview image by passing in $(PREVIEWFILE) as well as $(IMAGEFILE), so in the absence of a capture command, cp $(PREVIEWFILE) $(IMAGEFILE) could be used. This seems a confusing option.